Think that 'eating like the French is impossible'? Check out these Japanese school lunches…healthy meals cooked from scratch! Think that ‘eating like the French’ is impossible? According to the Washington Post, Japan has a similar approach to France when it comes to kids’ food! 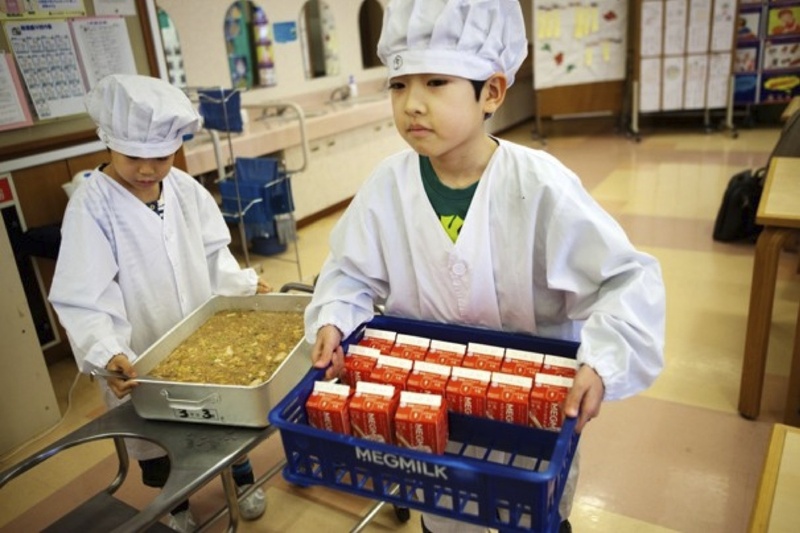 Healthy lunches prepared from scratch in Japanese schools. Now….how many different foods did your child eat today (or you, for that matter)!? « Lamb's lettuce and spinach, roast turkey and potatoes….what French kids are eating, this week in Lille! I moved to Paris when I was 10 and was indeed compelled to eat more widely by peer pressure – my new friends ate sea snails and duck after all. And I was never, ever allowed soda, juice or milk with dinner – water or nothing. But also, I have spent years working as a pre-school and kindergarten teacher in South Korea. I always used to giggle thinking of American kids and their fussy eating habits when the Korean kids would get excited about seaweed or bean sprout soup, quails eggs, octopus stir-fry, and spicy kimchi. They fought over who got extra dried seaweed with their plain white rice and pickled radish. They also were only given water with lunch. This was the same in every school I worked in. They ate the same items for breakfast and dinner. I see no reason why North American children have the go-ahead to be fussy eaters – it is not a genetic predisposition to have a whole generation of kids who only want to eat plain pasta and chicken nuggets, it’s cultural. I think they are enabled by the adults, and that’s that. Thank you for your thoughtful blog! ooooh la la la la – we French have some competition!!! 🙂 that is good – we need to all compete for improvement in the realm of food exposure. Great article. Interesting. Good for Japan! I wish the US would get on board with a healthy menu for schools, too.